Homvale rivet nuts provide strong fastening threads in thin panels. They create a strong thread in thin sheets of material for high strength fastening from bolts and other threaded articles. Rivet nuts can be made from aluminum, steel, stainless steel, Monel, and brass. However, the most popular material is zinc-plated steel since it is proven effective. Why choose our Rivet nuts? A rivet nut tool is your best partner when your projects require installations that require having a rivet nut fastener. 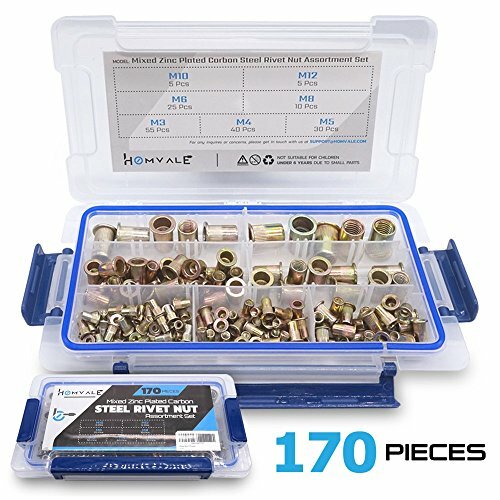 Rivet nuts have far greater loads than any regular sheet metal screw. Thus, a rivet nut tool is highly recommended. This tool is rust resistant and strong enough to apply in many kinds of heavy-duty materials including sheet metal, steel, aluminum, plastic, fiberglass etc. Installing a rivet nut tool is not as difficult as it may appear. In fact, you can install a rivet nut in a few minutes. With this tool, you can easily finish the job that needs to be done. ●Made from High-Quality Carbon Steel with carbon content for better attachment to various items. Nuts have a work-hardened surface providing high-strength, load-bearing threads. It is Yellow Zinc Plated finish and has a total package quantity of 170 pieces. ●Can be used in almost all construction purposes such as steel, plastic, and fiberglass and other DIY projects. These tools are also ideal for use by a variety of workers and repairmen both professional and amateur, even DIYers can opt to use it. ●Comes with a solid plastic organizer made from high-quality material to efficiently and effectively bear the weight of the whole package. It is safe and easy to carry since it is provisioned with 3 snap locks that hold the lid of the container tightly securing its contents inside. Because of this feature, the locks prevent accidental overturns or spillage of the contents. ●Package Assortment: M3 (55 pcs) / M4 (40 pcs) / M5 (30 pcs) / M6 (25 pcs) / M8 (10 pcs) / M10 (5 pcs) / M12 (5 pcs). This set is organized by size in a transparent storage case for quick access and protection. ●GUARANTEED ENVIRONMENT-FRIENDLY not only it is made from high-quality elements, this kit also promotes environmental protection and is definitely toxic and poison-free. If you have any questions about this product by Homvale, contact us by completing and submitting the form below. If you are looking for a specif part number, please include it with your message.